Johnny Eames and Gianluca (Rio) Di Caro, partners of the famous London fight factory The TRAD TKO Boxing Gym, today announced that they have recently created a new promotional company, Showtime Sports Events Limited, and that in 2013 they are to promote events in both the UK and overseas. Showtime Sports Events Limited was created by the esteemed pair with longtime associate Gary Barber, for the specific purpose of partnering with his Royal Highness Sheikh Khaled Bin Mohammed Al Qassimi, His Excellency Khaled Abdulla Al Mansoori, World sanctioning organization The World Boxing Federation, UAE based Durar Advertising LLC and security specialists Gulf Risk Management, to promote boxing events Worldwide as well as develop a professional boxing culture within the Gulf region. It was also announced that they are about to ink a deal with Brooklyn, New York’s WBA World Welterweight Champion Paulie ‘Magic Man’ Malignaggi to defend his crown, as well as compete for the newly vacated WBF World title, against Buenos Aires, Argentina’s Diego Gabriel Chaves, on their first major international event, which will take place in Abu Dhabi, probably in April. “Firstly I’d like to say how excited I am with what’s happening. After fifteen years in the pro boxing game, kicking my heels, so to speak, and working off broken promises from certain promoters and letting boys down through no fault of my own, I’m finally in a position where I can give promises I know I can keep. Our aim is to promote the biggest and best events we can, we have a vast amount of funds allocated to us to pull in the biggest fighters, not just for the Abu Dhabi and the Middle East project, but also for shows we are putting on in Great Britain. The hard work that Gianluca, as well as our partners, have put in over the past year to make this all come together has finally paid off. It’s going to be huge, it’s just a pleasure for me to be part of it and it’s really exciting for me to be part of it. Our first promotional date, in the Middle East, looks like being in April. We had made separate approaches to two of the three biggest fighters on the planet, Manny Pacquiao and Juan Manuel Marquez to headline. Unfortunately our timing or something like that didn’t work for them, so we had to move on, but we’ve still got a big name, Paulie Malignaggi, headlining our first show, supported by a great undercard. It’s also fantastic to be working on this project alongside the World Boxing Federation, an organization I have had the privilege of being involved with for the past sixteen months. Now we are looking forward to attracting the biggest names in the sport to fight on our shows, as well as compete for WBF Championship honours. We are particularly pleased to have the WBF involved in this project, especially since a WBF Champion of the World is just that; the one and only, not one of many. “It is our intention to attract the best boxers for our events, we want exciting all action Battle Royale’s that will enthrall and entertain the fans. We are not naïve, we want to develop our own stable of World class boxers, but this will take a little time. As such, we are fully aware that we need to build strategic working relationships with all the top promoters world wide, something we have already begun to develop, in order to secure the best fighters for our shows, not just the first few but for all future events. Talking about World class fighters, whilst it is true we did approach both Manny Pacquiao and Juan Manuel Marquez with multi-million dollar offers, I’d like to point out that we did get one of our first choice fighters in Paulie Malignaggi. Originally we had targeted Paulie Malignaggi versus Ricky Hatton to headline our first event, however, Ricky lost to Vyacheslav Senchenko and immediately announced he was retiring again. We began looking for an alternative, it was only then did we approach Marquez. After weeks of discussions it was clear that JMM wasn’t going to come onboard, Nacho Beristein made a statement in the Mexican press saying about the massive offer, but also stating Fernando Beltran and Top Rank have priority. We then started initial discussions with Brad Jacobs for Manny Pacquiao, with a similar offer to that we made for Marquez, but virtually straight away the press reports, coming from Bob Arum, made clear that he didn’t want Manny to fight before the proposed Pacquiao-Marquez five, so we didn’t bother to progress this further as it clearly wasn’t going to pan out. Things changed the moment I heard that the negotiations for Paulie’s fight with Shane Moseley had broken down, I called Paulie straight away, within the hour discussions were already being held with Steven Bash from his management team. I would like to thank Paulie, Steven and Golden Boy’s Richard Schaefer, for their professionalism and willingness to discuss our proposal. I mean, it’s been just over a week since we first spoke, yet we are now just days away from signing contracts. This is going to be one helluva show, besides Paulie Malignaggi versus Diego Garcia Chaves in a WBF/WBA title clash, this mega event also features five further proposed Championship bouts, including a mighty clash between two current World Champions, as WBF Super Middleweight World Champion, Mexico’s Marco Antonio Rubio, switches back to his preferred Middleweight division to challenge current WBF Champion Ukraine’s Vitaliy Kopylenko. We have South Africa’s Zolani Morali, who has the unenviable task of defending his WBF Light Welterweight crown against one of the toughest stars of the division, Russia’s Denis Shafikov. Keeping in a similar vein, France’s WBF Light Heavyweight Champion Nadjib Mohammedi has an equally tough proposed defense, against exciting Simi Valley, California, USA, based Ukrainian Ismayl Sillakh. South Africa’s World #2 ranked Flyweight Moruti Mthalane takes on the #3 in the division, Philippines super star Sonny Boy Jaro for the vacant WBF Flyweight World title. 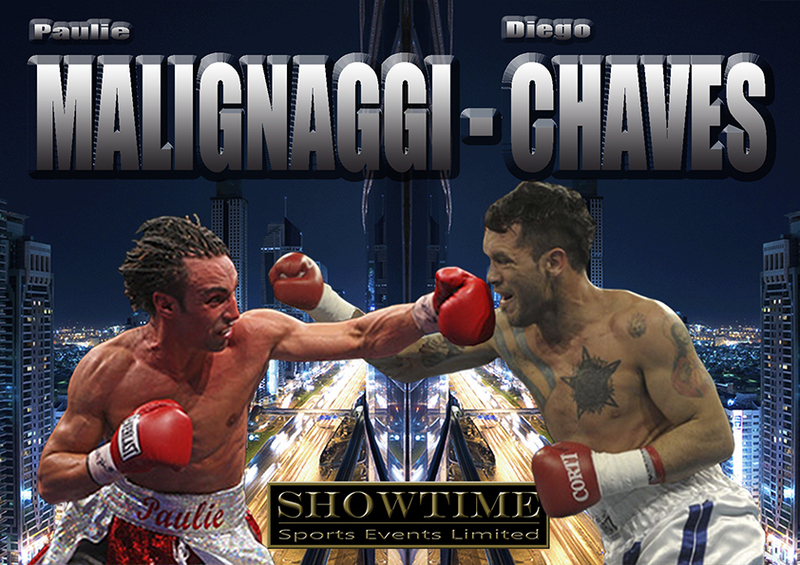 The final proposed Championship bout features former British and IBO World Champion Colin Lynes, battling it out with Poland’s EBU-EU Champ, Rafal Jackiewicz, for the vacant WBF Inter-Continental Welterweight title and possibly the right to challenge the winner of Malignaggi-Chaves for the WBF World crown later in the year. In addition there will be four non-championship bouts, featuring four fantastic young stars of the future. I’m not going to say too much at this point, but one of these kids will be Heavyweight Champion of the World and what’s more he’s already signed to us.